Helena Sternkopf, recent graduate of the Master program in Business Intelligence and Process Management at the Berlin School of Economics and Law (year 2015-2017) is awarded with the first prize at the TDWI AWARD 2017. Doing Good with Data – the slogan that served as the basis for Helena Sternkopf’s master’s thesis in which she explored data literacy competencies in Non-Governmental Organizations and developed a first attempt to represent these competencies in a maturity model. The findings of the research project were not only rewarded at the BSEL with an excellent grade, but also attracted interest outside the university at the jury of the TDWI AWARD. With her master’s thesis that investigated the topic of Doing Good with Data – Development of a Data Literacy Maturity Model for Non-Governmental Organizations, supervised by Prof. Dr. Roland Müller and Prof. Dr. Frank Habermann, heads of the BIPM program, Helena Sternkopf won the first prize of the TDWI AWARD 2017. 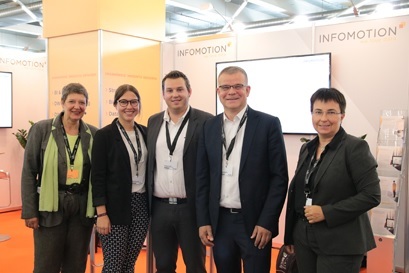 The TDWI (Transforming Data With Intelligence) e.V., an international organization for Business Intelligence and Analytics, the Technical University of Chemnitz and INFOMOTION GmbH tender a yearly award for outstanding degree theses on the occasion of the European TDWI Conference. The awardees receive a generous financial reward and will publish a shortened version of their theses at BI-Spektrum, a journal for Business Intelligence and Analytics. Additionally, Helena Sternkopf was invited to present her topic at the TDWI Conference 2017 in Munich on June 27th. Her work contributes to the growing academic interest in exploring and describing data literacy. Data Literacy is the ability to use data productively and to think about it in a critically reflective way. However, can its complexity really be broken down to only this? Existing research confirms that it cannot. However, data literacy is one of the most important skills in the 21st century for organizations, employees, and citizens. But how can we use data productively, if there is still a gap in understanding data literacy competencies and what exactly to expect from it? In her thesis, Helena Sternkopf presents a data literacy maturity model especially for non-governmental organizations (NGOs) to create a first attempt to answer these questions. Based on the development of a preliminary maturity model, Action Design Research was used to develop the model throughout three iteration phases. The main contribution is a data literacy maturity grid that describes eleven data literacy competencies on four competence levels that is complemented by a self-assessment tool. The proposed maturity model should enhance the understanding of the required skills that are needed to kick-off data projects, identify strengths and gaps and thus will empower to plan future data-practices in accordance with pre-defined goals. The thesis was written in cooperation with the Datenschule, an educational program of the Open Knowledge Foundation Germany that provides technical training and consulting to NGOs to progress their data practice. The maturity model is now used as a planning and reflection tool to support the Datenschule’s training activities. You can read more about the thesis and how it is applied on the website of the Datenschule. We would like to congratulate Helena to her great achievement and hope that this will help many NGOs in the future.